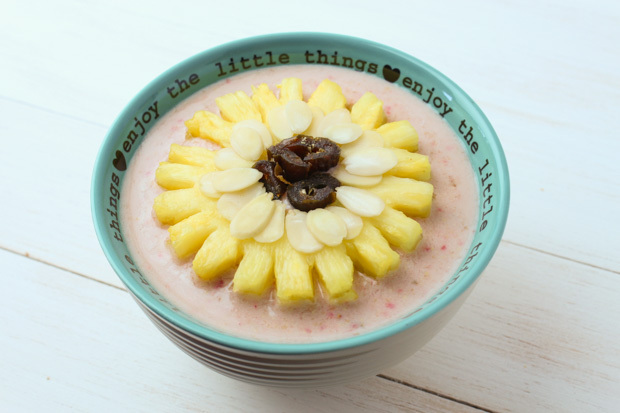 Enjoy the little things with this simple, nutritious and yummy smoothie bowl. In a blender, combine strawberries, ground flaxseed, vanilla, agave syrup and milk. Cover and blend until smooth. Pour smoothie into two bowls and top with blueberries, strawberries, almonds and flax. Serve and enjoy. Serving size: 1 1/4 cup (310 mL) smoothie plus toppings. Each serving contains 2 Tbsp (30 mL) of flax. Serving Size: 2 smoothie bowls.